Paragon Park. 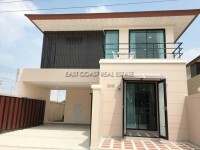 A small exclusive village located in the Huay Yai area of East Pattaya. The secure village has clean, wide landscaped roads and all electric cables are hidden underground so you feel at one with nature and the clear skies of Thailand. Each house is private behind 2m perimeter walls so there is plenty of privacy. This home offers a large 800sq.m area to accommodate the 3 bedroom, 3 bathroom property plus a nice landscaped garden, private swimming pool and ample private parking. Huay Yai is a small residential area roughly 15 minutes from Jomtien or Bang Saray beaches. Pattaya city is approximately 20 minutes commute, however large hyper markets such as Tesco Lotus, Big C & Makro are all dotted along the Sukhumvit road which are just 10 minute’s drive. Within the small community are plenty of local restaurants offering Thai and Western food or fresh seafood. Living area : 222 sqm.